STARTER programme ends with business and project ideas competition Kaleidoskoop. In the pre-selection round (13th of December), 10 best teams were selected to compete in the finals at international business festival sTARTUp Day (24th of January). FIND OUT THE TOP 10 FROM HERE! Pre-selection round will take place at the V spa conference center together with sTARTUp Artificial Intelligence conference! Pre-selection round is in 2 parts: from 2-4 pm and 4-6 pm. You can select the time that suits you better from the sign-up page. Teams that make it to the TOP 10 will get tickets to sTARTUp Day (max 3 tickets per team). 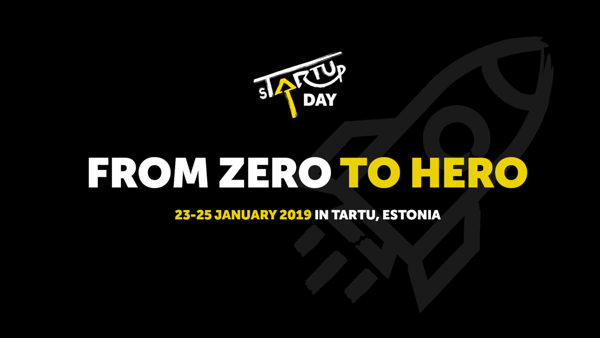 Judges: Aivar Pere (UT business advisor), Martin Vares (Fractory CEO), Sven Parkel (Tartu Biotechnology Park general manager), Giga Sesitashvili (Go Motors business analyst), Iuliia Trabskaia ( research fellow of entrepreneurship), Marelle Ellen (sTARTUp Day marketing manager). A perfect pitch would include the following information: team name, description of the problem, offered solution, potential market, competition, business model, the competence of the team. A pitch can be either in English or Estonian. But keep in mind that TOP 10 at sTARTUp Day can only pitch in English! Up to 3 slides can be used. Send them to Riin.Lisett.Rei@ut.ee. Deadline 11th of December. Slides need to be ppt file in size 16x9 and may not contain animations (because these might not work). If more than 3 slides are sent, organizers will select 3 to put to the ppt. NB! Organizers have prepared a slide with the team name for each team. Team must be registered before 11th of December 23:59.